As one of todays favorite performance bolt-ons, cold air intake systems kits deliver great looks as well as real world horsepower gains. As the originator of the first of these chrome systems back in the early nineties, our famous BBK line continues to offer the leading edge quality and function that BBK customers expect. All BBK cold air intake systems utilize a high flow washable conical cotton element filter and most are designed as fender well units to maximize performance. 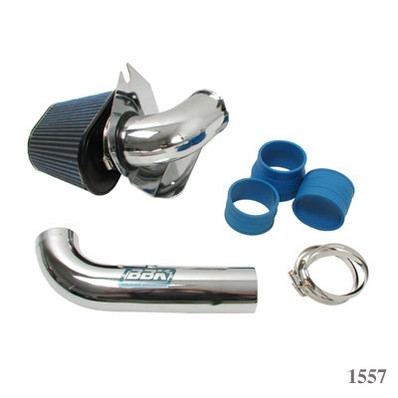 In addition to our standard hand polished and chrome plated cold air intake systems, we now offer a variety of kits utilizing a custom designed lightweight aluminum inlet casting, which is hand polished and chrome plated. These trick castings deliver unmatched quality and a custom fit for a variety of auto and truck applications. Each cold air intake model has been designed and dyno tested at the BBK headquarters in Southern California to maximize performance. 1986 1987 1988 1989 1990 1991 1992 1993 Ford Mustang V8 5.0 Cobra Roush Saleen & Steeda Vehicles. No one else can stack up to the bold clean styling of our aftermarket Billet dress ups, Street Strip & Racing Suspension & Performance Parts for your late model American Muscle Car!